Occupy Wall Street protesters hang out on the steps of the Federal Hall National Memorial after police pushed them off the Wall Street sidewalk, April 16, 2012. 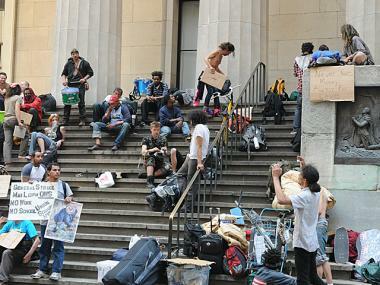 DOWNTOWN — Police arrested four Occupy Wall Street protesters who camped out on Wall Street Monday morning. The arrests represent the latest conflict between the NYPD and protesters, who have changed strategies recently and begun camping out on sidewalks on and around Wall Street rather than trying to occupy public spaces like Zuccotti Park. "[Police] said they needed to clean the sidewalk, that it's illegal to sit or lay on the sidewalk," said Lauren Digioia, 27, who said she has been staying on the sidewalks around Wall Street for eight days. Digioia said police started to push protesters down Wall Street toward Nassau Street about 9 a.m.
She said she saw one man get arrested trying to take video of the police. Another man, she added, was detained for writing on the sidewalk with chalk. Police confirmed that four people were arrested, but said no one has been charged yet. About 40 protesters regrouped Monday morning and sat on the steps of the Federal Hall, across the street from the New York Stock Exchange. The protesters are allowed to stay on the steps until dusk as long as they are "obeying [their] First Amendment rights [and] not disobeying rules," said Tom O'Connell, Chief of Operations, Federal Hall National Memorial. One protester said protesters are staying on the sidewalk to build momentum toward a May 1st protest and citywide strike. "This will be a very powerful strike, a way to show we are back," said Jose Briceno, 30, who has been staying on the sidewalks for about a week since coming to the city from Connecticut. "We don't have leaders, but we have clear goals." Briceno said his goals included "better regulation" of the banking system and "protecting people from losing their homes" because of the mortgage crisis. Some local workers stopped to take pictures and watch the protesters. "I think they're ridiculous, but what the hell," said a 50-year-old man who works for a local bank, and asked to remain anonymous for fear of getting trouble with his employer. "I used to go to Zuccotti Park to argue with them." When asked what specifically he argued about the man said he would base it on whatever vocal protester he happened to take issue with that day. "Just pick a sign and go from there," he said.